The TallWood House at Brock Commons is an 18-story, 400-bed student residence on the campus of the University of British Columbia. Reaching 53 meters, it has been recognized as the tallest hybrid mass-timber building in the world. 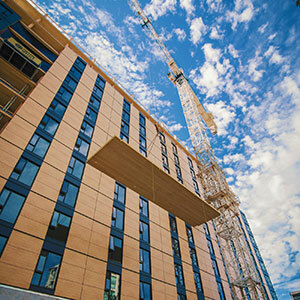 It stands as a testament to the advancement of engineered wood and demonstrates the feasibility of using mass timber for high-rise buildings. The building is comprised of 17 stories of unique timber structure: five-ply cross-laminated timber (CLT) floor panels, point-supported by glued-laminated timber columns, all resting on a concrete transfer slab at level two. Two full-height concrete cores provide lateral stability. By utilizing the two-way spanning capabilities of CLT, the beams of a classic post-and-beam system were eliminated, along with labor-intensive connections, which dramatically reduced fabrication and erection time, and costs. This floor system also significantly reduced the structural depth and created a clean, flat, point-supported surface for unobstructed service distribution.